As moustaches sprout on men around Australia taking part in Movember, The Conversation contributor Brett Goodin takes a look at the deep political and cultural connotations attached to facial hair in other parts of the world. This article is by Brett Goodin, Movember participant and PhD candidate in American history at Australian National University, and was first published by The Conversation. It is republished here under CreativeCommons- Attribution/No derivatives. You may notice more than a few of your friends and colleagues are a little more hirsute than normal this month. The annual charity event Movember encourages men to grow moustaches to raise money and awareness for men’s health issues, particularly prostate cancer and depression. As far as philanthropic gimmicks go, Movember is one of the best in the business. For once it’s cool have a ‘mo. For the other the eleven months of the year moustachioed citizens are subjected to jibes about their facial garb. But elsewhere in the world, facial hair has deep political and cultural connotations and has featured in international incidents. There’s nothing quite like the moustache to say you are serious in Middle Eastern culture. 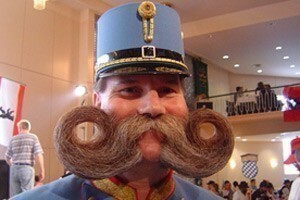 There the moustache represents the bristly line between tradition and modernity. Pledging reform during the Arab Spring while clean-shaven was a symbolic gesture by Syrian President Assad. He intended to convince the West and his country’s youth that he was serious. In Iraq, men literally swear by their moustache to seal a deal. Knowing that helps makes sense of an awkward moment in the lead-up to the 2003 Iraq War. This was read as more than a simple threat. Western journalists assumed the subtext was that the Kuwaiti representative “wasn’t man enough to deserve the moustache he wore,” and by extension his country’s policy of appeasing the American military was cowardly and without honour. This lesson on the significance of facial hair in Middle Eastern diplomacy was not lost on the American military. Ever-interested in winning hearts and minds, from 2001 to 2010, the US special ops soldiers in Afghanistan abandoned the Ken doll soldier look and cultivated bushy beards as a sign of respect for local culture. The plight of the beardless soldier has spread to Australian forces in Afghanistan. Despite severe water shortages, soldiers are ordered to shave daily. In fact the commanding officer of Mentoring Task Force 3 in Uruzgan province was so concerned about maintaining shaving standards he insisted that his subordinates sign an order which read: “Be a professional soldier, not a pirate.” The signatories quickly made T-shirts mocking the order. But it’s unlikely our boys in Uruzgan will join Movember this year. When the objective is to win respect rather than battles, the moustache has proven itself the most unlikely secret weapon in the US arsenal. More than 200 years ago, one of the few successful diplomats from America’s first conflict with a Muslim nation wrote of how his moustache was crucial in negotiations. In 1795, poet and diplomat Joel Barlow was sent to Algiers to secure the freedom more than 150 American sailors who had been captured there. “I am wearing large moustaches, long, beautiful, and black (a little grey however). Do you want me to cut them here, or do you want to see them and cut them yourself? Tell me, and I will obey you without the least resistance. I wager that you will tell me to cut them here, and I wager that you will be right. Just as facial hair has been used as a tool to ingratiate oneself with another culture, it has also been used for international, cross-cultural political protest. In 1953, in an attempt to defuse a political conflict, the British Governor of Uganda exiled the King of the Buganda region. The King’s male subjects vowed to grow their beards and hair until he was returned. Some of them were employed in the Ugandan civil service, leading the Governor to complain that the rugged appearance was not befitting of Her Majesty’s civil servants. Nevertheless, the beards stayed. Within two years this unconventional protest succeeded in ending the King’s exile, and the “band of bearded men” decided to meet at Entebbe Airport and collectively shave their beards as the King’s plane landed. Despite a cultural custom that the King could not touch another man’s hair clippings, the piles of shaven beards were scooped up from the airport floor and used as the stuffing of a cushion, which the King graciously accepted. The politics of facial hair turned violent in the late 1500s, when two Portuguese traders were captured after a battle with Tupinambá Indians in Brazil. The Tupinambá custom was to pluck their hair as soon as it sprouted from every part of their body. After they noticed the significance that the Portuguese attached to their beards, they decided to tear out their prisoners’ beards as a final humiliation before murdering them. So throughout this Movember, keep in mind the luxuriant international history of facial hair; its embodiment of masculinity and culture, its role in diplomacy, and the shame that it has to end on November 30.